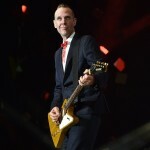 “Riding to the rescue came Orange County natives No Doubt, a band that in many ways KROQ made, providing a thrilling finale to a strong installment of the annual two-day holiday show. With an hour in which to cram a dozen songs, No Doubt stuck mostly to fan favorites, opening with “Hella Good” and its call to keep on dancing, and roaring through hits such as “Sunday Morning,” “Underneath It All” and “Just A Girl” in the first half of the set. No Doubt dressed for the occasion, too. Singer Gwen Stefani looked great in a sequined Santa Claus shirt, green-plaid drop-crotch shorts and knee-high Doc Martens. 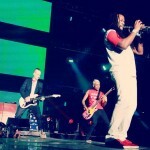 Guitarist Tom Dumont wore a red string tie with “Seasons Greetings” on its strands, while bassist Tony Kanal’s shirt shouted “Happy (Bleepin’) Holidays” and drummer Adrian Young’s kit was strung with Christmas lights. Gwen and Pharrell are performing tomorrow night in Hollywood! 1iota has posted a link to get free tickets on their web site. The event is called “1iota Sessions”. From the web site – “Join us for Special 1iota Performances featuring Blake Shelton, Gwen Stefani and Pharrell Williams on December 9, 2014 in Hollywood, California!” Blake Shelton is scheduled to perform at 7pm, and then Gwen and Pharrell at 8:30pm. 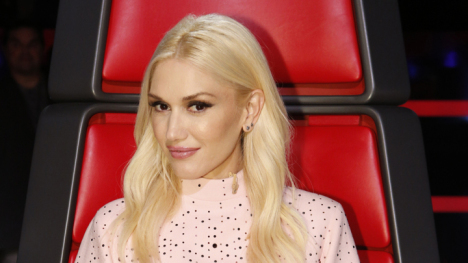 Between three kids, a coaching stint on The Voice and a solo music comeback, Gwen Stefani is keeping herself busy. So busy, in fact, that the No Doubt front woman had to lock herself in her bathroom to find a quiet moment away from her children during our interview. TIME caught up with the singer — just a few hours before she performed her new single, “Spark the Fire,” with Pharrell at KIIS FM’s Jingle Ball — to talk about her upcoming album (due next year), Pharrell’s recent comments about feminism and what’s up next for No Doubt. TIME: How did this third record come about? Were you itching to make another? Was Pharrell just sending you beats until you agreed? Gwen Stefani: We were doing a No Doubt record — we did it, we put it out, and as soon as we came back from Europe in January, we decided, “Let’s go back into the studio.” The record had taken so long to make because all of our parental commitments and lifestyles, and because of the way we work. It’s my fault, but I get really lazy around those guys. We were working within the band and didn’t have any collaborators, so it just took a long time. We went back in the studio and worked for about six months, and I think the last session that we did was with Pharrell. It was six months of struggle. It wasn’t coming really naturally. I got pregnant unexpectedly, and it was a good time to take a break. I didn’t even know that I was going to have another baby, but it was such a miracle. Hold on one second, my other kid is here. My son’s tooth just came out — sorry. They just got home from school. [To her son in the background: Go put this under your pillow!] I’m going to go in my bathroom so I can lock myself in there, hold on one second. Okay, so, we decided not to do any more work because I was pregnant — I was so sick. I didn’t know that was going to happen, and then I had the baby, and then four weeks later Pharrell called me to do Coachella. My kids were such a fan of him at the time because “Happy” was at the top of the charts. He was like, “Do you want to come do it?” I was like, “I want to! I’ll wear a black jumpsuit, I’ll be fine!” The first time I had left the house after giving birth was to step on stage and do “Hollaback Girl” with Pharrell. It was just magical. Then I found out a week later I was going to do The Voice, and I had no idea that was going to happen. When that happened, the opportunity came up — maybe I should put something out, even if it’s a collaboration, or hop on someone’s record. Pharrell kept asking me to do “Hollaback Girl,” and I was like, “I’m not going to keep doing the same song from 10 years ago!” The only way to do that would be to not do it with No Doubt, because we take forever. I just starting thinking about having an open-ended thing: let’s just see how far we get. I hooked up with Benny Blanco, who I’d been working with possibly to do some No Doubt stuff earlier during that time period. He got all these different writers together — Charli XCX, Ryan Tedder, Calvin Harris. I started hanging out with Pharrell and we went into the studio. I wanted to put a record out quick, like, I don’t want to think about it! Now, maybe I need to spend a little more time on it and not rush it. I’m going to continue to write a little bit. It’s been this weird surprise, doing new music. With the first solo records, I had a very clear plan of what they would be that was very distinct to that time period. Now it’s open-ended. I went in and did mood boards, a visual mood board of what it would be and started that way. With music, you sometimes just can’t really predict it. On Love. Angel. Music. Baby., you sang about the fear of going solo. And then on the follow-up, The Sweet Escape, you sang about feeling guilty for doing it again. Because of No Doubt or because of my kids? I can feel guilty about so many things. Because of No Doubt — you had that line, “Only one solo / I swore.” Do you still have that little voice of hesitation inside your head? There was a little bit, because I have so many different hats that I wear. I have my own life, I have my life as a wife, as a mother, as the singer of No Doubt, I’m on The Voice, and then I have all of my fashion designing things that I do. I’m always feeling like, am I giving enough to that? Am I giving enough to that? I just have to follow my instincts. When I did The Sweet Escape, I knew that I needed to do that. If you’re not inspired to do something, nothing comes. When I was about to do that second record, I did feel, “Should I go back and do another No Doubt record?” Everybody was waiting for me to do that, meaning my band. I just didn’t feel ready to do that music-wise, because I still wanted to do quirky dance music. This time, that wasn’t even a option. It was either no new music and do The Voice or do some more dance music and just be free and see what happens. It wouldn’t be an option to do No Doubt because there was was no time! I had a baby, and then eight weeks later I was shooting the campaign for The Voice. It was very quick and unexpected. No Doubt has a bunch of stuff that we’ve worked on, and we’re going to see where we go next. It’s interesting, because it’s not one or the other. No Doubt doesn’t have to be on a complete hiatus for me to do new music on my own. It can happen simultaneously. When Love. Angel. Music. Baby. came out 10 years ago, it didn’t sound like anything else out there. “Spark the Fire” is the same way — how do you pick sounds that still seem fresh years later? That is such a flattering, sweet compliment, but I obviously don’t think about that. When you’re going in, you’re just thinking about what’s going to come out. Pharrell is a genius. He’s not scared, and he is only interested in doing something that’s different from what’s out there, in a really dangerous, punk rock kind of way. I just love being around him, because he’s such a purist, and he’s competitive in such a positive, creative, artful way. Just being around his energy puts me in a whole new chapter. He’s just been so supportive of me, and I don’t understand it. I’m like, “You’re the biggest, most incredibly talented, forward, modern producer-songwriter-artist of our generation! And I get to hang out with you and piggyback on all your success?” I’m so happy about it. He’s so generous and just wants me to do that. He presented two songs to me that he wrote, and they were so weird and crazy. I was like, “But I really want something hard” — I don’t remember saying that, but he says that’s what I said. He came into my trailer at The Voice and was like, “I gotta play this!” He was crazy about it. We were meant to be going on [stage], and he’s like, “I don’t care!” He’s setting his Beats Pill up. “It has to have bass in it, if you’re going to hear it!” He plays me this song, and it was the beat for “Spark the Fire.” I was like, “That’s it, that’s it, we’re going to go in.” It sounded like a really good idea that morning, but by the end of the day, it was like, “Are we really going to the studio right now?” We went in and wrote that song. It’s so weird. Come on! I mean, it has this weird intro, this weird bridge, the lyrics are all over the place. It’s perfectly a mashup of us together, and it totally defines where I’m at. Pharrell says this song is about feminism, which I’m not sure I get. He calls it a feminist anthem. I would never call it that! Because it’s just not. That’s what he sees in me — I don’t see that. I see it as a personal song that is a really positive message about don’t mess with my vibe. I’m going to be up here, don’t bring me down. Get off my cloud, because no one’s going to take me away from this positivity. If I don’t do any other songs in this moment in my life, this one is definitely a good one to define this period. That’s all I can ask for. I just feel more grateful than ever if anyone pays attention. The longer that you have a career, the more precious you are about it, the more grateful you get, the more you realize that at any point it’s going to be gone. You don’t let one minute tick by where you’re not grateful for anyone listening to your song or getting joy out of that. Looking back on Love. Angel. Music. Baby., do you regret the Harajuku Girls given the criticism you received? No. There’s always going to be two sides to everything. For me, everything that I did with the Harajuku Girls was just a pure compliment and being a fan. You can’t be a fan of somebody else? Or another culture? Of course you can. Of course you can celebrate other cultures. That’s what Japanese culture and American culture have done. It’s like I say in the song [“Harajuku Girls”]: it’s a ping-pong match. We do something American, they take it and they flip it and make it so Japanese and so cool. And we take it back and go, “Whoa, that’s so cool!” That’s so beautiful. It’s a beautiful thing in the world, how our cultures come together. I don’t feel like I did anything but share that love. You can look at it from a negative point of view if you want to, but get off my cloud. Because, seriously, that was all meant out of love. And the girls themselves, it was just a magical thing to get to know them. They were dancers that were cast, but they became real. One girl was a Japanese girl that grew up in L.A., and she got to hang around with three different Japanese girls that were from different places in Japan and had different backgrounds. They became best friends, and she got to go to Japan and see her heritage and see how we are all the same. And I got to hang out with girls for the first time. Both singles will appear on Stefani’s upcoming third solo record, which very nearly almost never happened. The pop icon spoke with SPIN about the writing and recording of her newest effort, reuniting with No Doubt, and working alongisde new collaborators such as Calvin Harris and Charli XCX.. Your new single features production by Pharrell. What do you think he brings out of you as a collaborator and producer? Our whole relationship is crazy because back in the day, I really wanted No Doubt to do something with the Neptunes. I thought, “Let’s do something with someone outside of the band. Lets write a song with someone in hip-hop.” That was the skinny of our Rock Steady album, which was all about collaborating and being open. It’s my favorite that we’ve ever made. We went in the studio and wrote “Hella Good” really quickly. I noticed that Pharrell wasn’t just a hip-hop guy. He was always in his own lane. I noticed so many similarities between us in the things we like to write about, like style, and fashion, plus we both love Japan. We weren’t friends yet then. We did the song together, but then when I did “Hollaback Girl,” I spent a lot more time with him. Then time went by, and I hadn’t really seen him. Then, all of the sudden, he does Despicable Me, and I was like “Whoa, that’s incredible! You did a soundtrack!” Then my kids started going, “I want to be in the ‘Happy’ video!” I emailed him like, “My kids are obsessed with you and I need to send you a video of them doing your song!” He wrote me back saying, “That’s awesome. I’m doing Coachella, I know you just had your baby a minute ago but we should do this together.” I wanted to do it because I wanted to show off to the kids and it seemed so fun. The first time I left the house after giving birth was to go on stage and do “Hollaback Girl” with Pharrell at Coachella. Then [they] called me about The Voice, and I was like, “That’s crazy, would I do that kind of thing?” Then I found out Pharrell was doing it, so we decided to do it together. I think he’s an incredible guy. He has so much wisdom and positivity and he really has a way of making me feel good about myself. Being around that makes you wanna do great things. Was Pharrell bringing you out at Coachella the impetus for your return to solo music? What was it about right now for you that felt right for a return? That’s a really good question. To be honest, I had no intention to ever do another solo record. 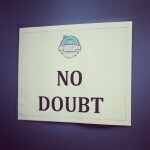 I was in the studio with No Doubt after our last record. That last session we had was with Pharrell, and then I got pregnant unexpectedly, like a teenager. I got very sick, so everything stopped. Only four or five weeks after I had the baby, they called me to do The Voice. I was never expecting to do that, but when the opportunity came along, I was also itching to do new music. I didn’t even care if it was hopping on someone else’s song, I just knew that I couldn’t keep being the “Hollaback Girl.” Something new had to happen, and there was no way to do a No Doubt record in that short amount of time, because the way we write, it takes a long time. At first I was like, “Oh, I’ll just put out a record! Let’s do it!” But now I’m like, “Wait a minute.” I feel like I was getting rushed by doing the show and trying to put the record out and having a new baby and doing No Doubt shows. It was just a lot to handle at one time, so I’m still working on the music and I think the only way to do it right now, with everything going on in my life, is to collaborate. Some of the best thing I’ve ever done — things I think are my favorite — are the collaborations. Maybe then I’ll go back and do some No Doubt stuff. I feel like I’m in a time period where I can’t predict what’s gonna happen. I feel really happy to have something new out. It’s scary, too, because now everybody has such access to you and you have access to what everyone thinks of you, and I really didn’t really grow up that way. In terms of collaborators, I read that you worked with Charli XCX on a session, and you’ve mentioned not liking to write with women in the past. Why is that, and what was it about Charli that clicked? Yeah, the way that Charli and I worked together was that we really didn’t work together. [Laughs.] She wrote with Benny [Blanco] and then I wrote with Benny separately. I wrote her an email and was like, “This is so weird that I haven’t ever met you and now we have this song.” I think out of all the writers out there, male and female, I really like her style the most. I think that she comes up with really good melodies. I feel really lucky to work with her in the weird way that we did. It’d be interesting to actually be in the studio with her. I’d be intimidated. It’s always awkward for me to be vulnerable when I’m in the studio with people, but sometimes really great stuff comes out of that. You just have to be brave enough to do it. I would love to work with Chris Martin, too. I’ve tried to get him to work with me for ten years, so maybe he’ll do it this time. [Laughs.] I just did stuff with Calvin Harris too. I’ve got a good start on the record. Sia and I did a session with Pharrell and No Doubt. She’s a genius and I love working with her. There’s a song on the record called “Start a War” that she wrote that I’m very grateful for. I think that girls are gonna love that one. I’m gonna definitely go back in with Pharrell, and I know that I want to work with Diplo. There’s so many people! I just feel happy to be doing new music. I didn’t really count on it. I always thought that no one would care about me anymore, and then I would fizzle out and I’d have my family and my clothing lines. That was the plan I had 12 years ago when I started L.A.M.B. I was like, “I’ll do my line and I’ll have my kids, and that’s it.” Being able to do new music is more precious than ever before. I heard rumors that No Doubt plans to reunite to headline some festivals next year. How excited you are to play new stuff for the fans? It’s surreal to be up there with them. We still have a lot of fun onstage because we have a lot of chemistry and once we get together, it really feels like we’re being transported to a place where no time has passed. It’s a great feeling and it’s something that I’ll never be able to get anywhere else but right there with [those guys]. “We’re constantly taking fashion (and beauty) cues from trendsetting designer, musician and Voice judge, Gwen Stefani. But where does the icon draw inspiration for her always-envious rocker-chic style? Her younger self. “I had a couple of hard years,” says Gwen Stefani, looking back on the sessions for No Doubt’s 2012 album, Push and Shove. It was the band’s first LP in 11 years, and Stefani recorded much of it while her husband, Gavin Rossdale, was on tour with a reunited Bush, which left her to handle her sons Kingston, now 8, and Zuma, 6. “I would get my kids ready for school, drop them off, go in the studio and be home by four to make dinner.” The record scored no hits, and the band didn’t tour after its release. “I’m sad it didn’t connect,” she says. They recorded two songs, the frenetic dance-pop cut “Spark the Fire” and a punkish track on which Stefani sings about emojis. “I went, ‘Oh, my God, it’s the evolution from what I did before,’ ” she says. After that, Stefani started recording in her living room with producer Benny Blanco. “She’s an open book,” says Blanco. “She’s cuckoo, she’s a superhero, but there’s vulnerability there.” Stefani also wrote with young hitmakers like Calvin Harris and Charli XCX (“I don’t usually want to work with other girl writers – but she had my vibe”). “Even the biggest people [she worked with] were star-struck,” says Blanco. 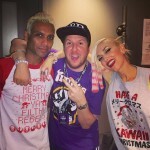 No Doubt to play KROQ’s Almost Acoustic Christmas! 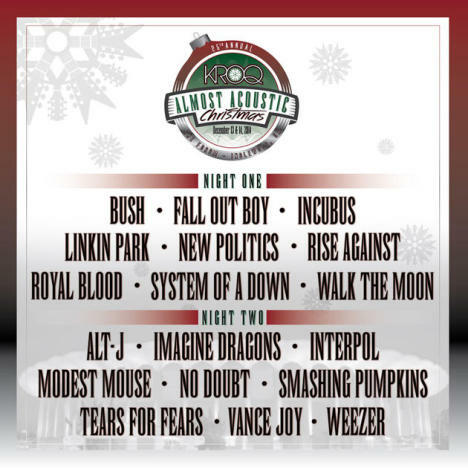 “We’re excited to announce that we’ll be joining the incredible lineup at Night 2 of the 25th Annual KROQ Almost Acoustic Christmas at The Forum on Sunday, December 14! “Our friends NO DOUBT have been added to the night 2 lineup! This will mark the 6th appearance at the KROQ Almost Acoustic Christmas for the band, who last played in 2012 when they came out as the surprise guest. The band will perform alongside other night 2 bands Alt-J, Imagine Dragons, Interpol, Modest Mouse, Smashing Pumpkins, Tears For Fears, Vance Joy, and Weezer. 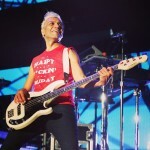 No Doubt bassist Tony Kanal called in to The Kevin & Bean Show this morning (12/4) to break the news on-air with the guys. Listen to the full interview above. “Gwen Stefani is taking her cues from Justin Timberlake. Like JT in 2013, her last solo album was released in 2006 (The Sweet Escape), so anticipation for its follow-up (due in early 2015) and accompanying tour is high. Along for the ride: MasterCard, whose Priceless Surprises program Timberlake helped co-found as part of a multiyear partnership inked with the company in 2013. Beginning Dec. 8, Stefani will be the new face for the campaign and appear in a TV commercial giving out everything from a handbag to concert tickets. The partnership tees up a busy 2015 for Stefani and MasterCard that will include live events, support of her next solo album and upcoming projects with No Doubt, her first tour since 2007 and “Priceless Surprises” in markets around the world. Timberlake, for example, starred in a 2014 Grammy spot in which he showed up unannounced on a fan’s doorstep, and participated in other surprises in Canada, Turkey and Australia, among other markets. “Spark The Fire” music video and song available now! There is a link in the video description to buy the song on iTunes, but it’s currently saying not available in the USA for me. Should be working soon, I’d think. Here is the link to iTunes. You are currently browsing the Greener Pastures – a No Doubt fan site archives for December, 2014.